For years, I’ve worn a cross whenever I fly. A superstitious ritual, perhaps, since I rarely wear a cross on the ground. When I fly I wear a cross to reassure myself that faith (not necessarily mine, some days) is stronger than my chronic travel anxiety. Most recently, instead of a cross, I’ve flown wearing a necklace my new friend Nikki. made. She makes jewelry out of junk: others’ cast-off jewelry, hardware, children’s toys, and other small items. the tag line of her business is “everything is beautiful in its time, even nuts, bolts, and washers.” Every time I see Nikki, she is wearing a new creation: a pendant made of a small metal plate with a piece of a vintage earring dangling from it, a ring made from a doll’s teacup, a pair of earrings from light-catching dashboard fuses. Take a look. 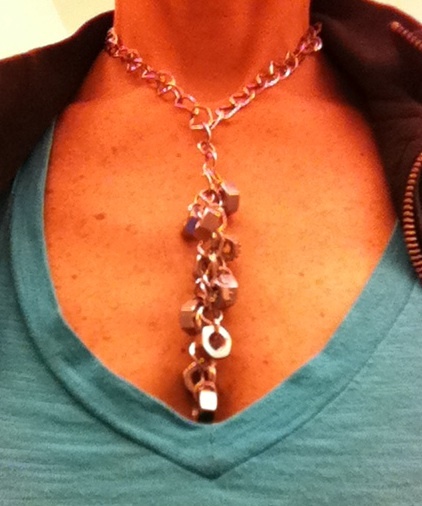 I’ve learned not to gush too much over Nikki’s jewelry, because she is prone to take it off and give it to me. She won’t take my money, and I know she depends on jewelry sales as a portion of her income. I keep my mouth shut so she can sell it to someone else later on. Over coffee she told me about how she was prostituted by her mother as a child, and subsequently abused by her stepfather. In the same paragraph she talked about her life in the suburbs, her wonderful husband and two small children, and her jewelry-making, how the ability to see beauty in odd objects and discarded broken things came to her as an unexpected gift. The necklace I wear whenever I fly these days is the one she wore that day. It’s made of nuts and washers, pieces of something else that were formerly left for dead. It has become my talisman for survival, for the triumph of life and hope over fear and death. The hex-nuts hang down like a bunch of perfectly ripe grapes and are irresistible to play with mid-flight, their satisfying weight and shape as reassuring to hold onto as any cross.